Superintendent Eddie Johnson told Good Morning America that there are witnesses and evidence that have not been presented. A member of Smollett's legal team however, continues to criticize the police. NBC 5's Ash-har Quraishi reports. “Empire” actor Jussie Smollett reportedly wrote on a check to one of the brothers he is accused of paying to stage an attack on him that he was paying for a nutrition and workout program. Images of the check, first published by TMZ, show a $3,500 payment to Abimbola Osundairo, the same amount police allege the actor paid Osundairo and his brother to stage a racist, anti-gay attack on him. A memo line on the check read "5 week nutrition/workout program (Don't go)." The check was dated Jan. 23, six days before Smollett claimed he was attacked in Chicago. TMZ also published text messages between Smollett and one of the brothers in January discussing grocery lists, meal plans and music video shoots. The publication reported Smollett was looking to lose weight before shooting the music video for his song "Don't Go," which would feature him shirtless. Sources familiar with the material told NBC News the images are authentic, but it remains unclear if they are related to the case against Smollett. NBC News has not reviewed the check or texts. 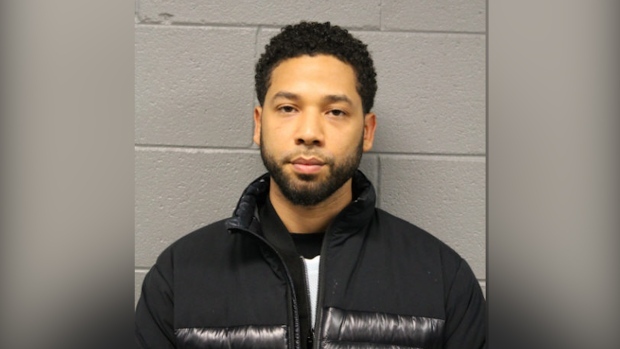 Smollett denies the allegations and has maintained his innocence. "The presumption of innocence, a bedrock in the search for justice, was trampled upon at the expense of Mr. Smollett and notably, on the eve of a Mayoral election," Smollett's legal team said in a statement last week. "Mr. Smollett is a young man of impeccable character and integrity who fiercely and solemnly maintains his innocence." Chicago Police Supt. Eddie Johnson told "Good Morning America" Monday "there's a lot more evidence that hasn't been presented yet and does not support the version [Smollett] gave." "It's important for people to recognize that it's not the Chicago Police Department saying he did something, it's the evidence, the facts and the witnesses that are saying this," Johnson said in the interview.